The first in our exciting quarterly series, The Numismatic Masters Internet Auctions, featuring offerings from the collection of D.L Hansen, has just ended with tremendous results. We would like to extend our thanks to all those who participated in this auction, making it one of our most successful online events ever. Total sales topped 1.7 million on just 302 total lots! Bidding was lively throughout this extended sale and active right until the final minutes of closing. Congratulations to those who won their desired lots! To read more about our inaugural Numismatic Master Auction, check out our blog post here! We’ve been using this week to catch up on some long-awaited projects and get ourselves straightened out for the April/May run of shows. Things typically slow down this time of year for a few weeks, and it’s well-needed for us. However, we’re not stopping progress by any means! In fact, we have more new coins in the coming weeks than is typical and hope that you’ll find something of interest, whether via direct sale or auction. Thanks again for reading and we wish you all a wonderful week ahead! Why we love it: A first year example of the With Motto Design for the series that is a scarce date in gem condition. This pristine, stunning gem displays incredible amounts of blazing luster along with ideal coloring that make for premium eye appeal. This Saint Gaudens Double Eagle issue comes from a lower, original mintage of just 156,258 coins struck in which only 13 are graded finer by PCGS. Value: PCGS reflects a value of $12,500 on this coin with the CPG sitting at $12,400. Available for purchase for the fair price of just $11,250 via Make Offer, this is a great opportunity to own this gorgeous example of a scarce date in gem condition! Why we love it: An intriguing complete set of Indian Quarter Eagles that is completely fresh and original, featuring all attractive coins that represent their grade nicely. Having never been to CAC, there are numerous angles for this unique collection that prove potential for the future buyer. All the coins are in Old NGC Holders, except for the 1909 and the 1910. 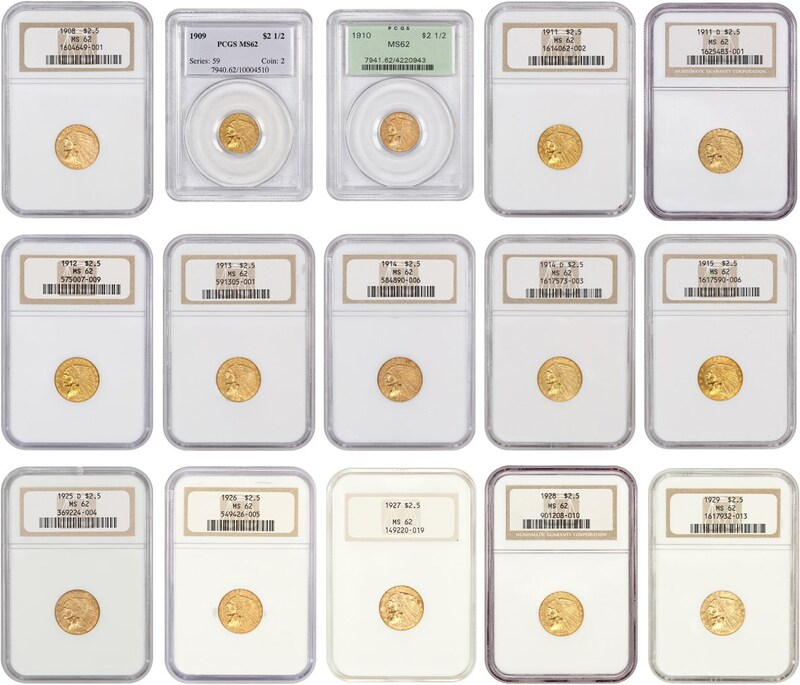 Value: he PCGS Price Guide has this complete 15-coin set valued at just under $15,000. It is available in this week’s auction with the reserve set at the fair and reasonable amount of just $14,700. That is right on par with the PCGS Price Guide value for this impressively-matched complete set of the Indian Quarter Eagle Series! 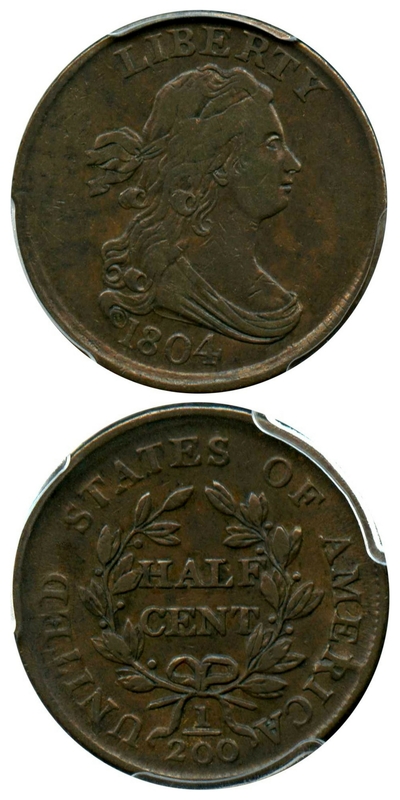 Why we love it: Proof Half Cents are an unusual type that we come across sparingly. When an affordable, attractive piece presents itself, it’s always an interesting item that we want to offer. This piece, a beautiful near-gem example of this scarce proof Half Cent has gorgeous, rich coloring. This rare coin displays stunning, captivating eye appeal from its pristine, nicely toned surfaces. 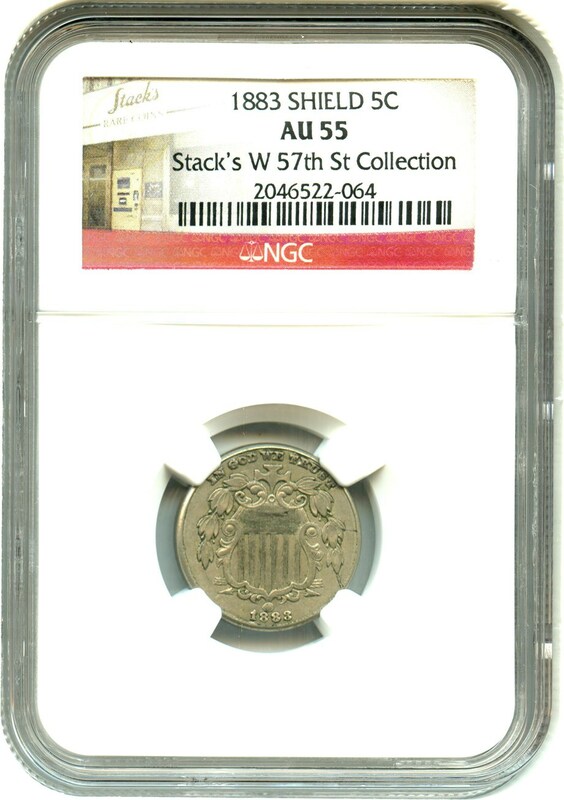 This proof Half Cent issue comes from a shockingly low mintage of about 30 coins struck in proof format in which only five are graded finer by PCGS. Value: The PCGS Price Guide has this coin valued at $8,000. With a CAC-stickered example in this grade not presenting itself previously, it is reserved in this week’s auction at the reasonable amount of just $7,250. In our opinion, this is a fantastic deal for a quality example of such a scarce, gorgeous near-gem proof Half Cent even with CAC approval! Why we love it: An immaculate ultra-gem proof Shield Nickel that features stunning, blemish-free cameo surfaces. The coin’s light, attractive toning and incredible contrasts between the devices and fields make for stunning, nearly perfect eye appeal. This Proof Shield Nickel issue comes from a low, original mintage of 3,100 coins struck in proof format in which this example is tied for the finest known! Value: With the PCGS Price Guide at $15,000, this coin is available in this week’s auction with a reserve set at the reasonable amount of just $10,500. This lower mintage, pristine ultra-gem proof Shield Nickel that is tied for the finest known in existence is sure to go quickly in auction this Sunday! Why we love it: A rare near-gem proof Liberty Half Eagle that is incredibly underrated as it is over-shadowed by the rarity of the circulation strike of the same date. This piece exhibits beautiful, flashy cameo mirrors with the slightest mark below the hair on the obverse. The reverse displays hairlines that are acceptable for the grade; however, overall this rare coin features truly quality eye appeal. 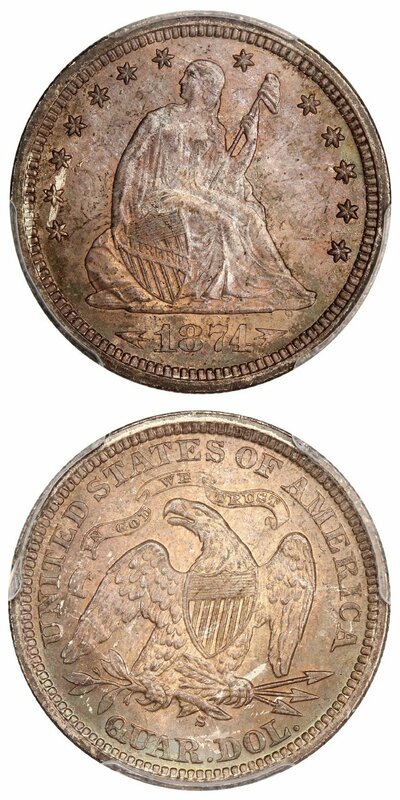 This Half Eagle issue comes from a tiny, original mintage of just 20 coins in which only two are graded finer by PCGS. Value: This incredibly rare proof issue comes from a minuscule mintage of just 20 coins struck. It is estimated barely half of those have survived, and only two of them were graded finer by PCGS. This stunning rarity that does not appear in private or public auctions often is available in our weekly auction series reserved reasonably at $177,500. Why we love it: One of our favorite key date issues from the early 20th Century, this is a grade that is scarcely seen for the variety. This piece displays lightly worn, original surfaces with gorgeous golden toning throughout the coin. For its grade, this coin has surprisingly nice luster with well-struck surfaces and premium eye appeal. A perfect AU example with the stunning gold tints and incredibly strong detail in the devices. 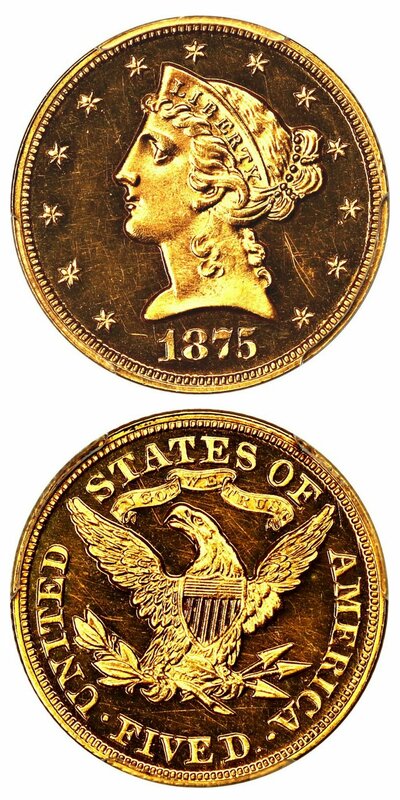 Value: This coin is listed in this week’s auction with the reserve set at the fair amount of just $18,500! The CPG price of $19,500 and PCGS Price Guide at $21,000, we think this is a great value for a scarce and popular overdate Buffalo Nickel with plenty of remaining luster and beautifully golden toned surfaces! Why we love it: A beautiful gem Liberty Seated Quarter type coin from the San Francisco Mint. Between its pretty, rich rose-gold toning and strong underlying luster, this CAC approved coin displays high-quality eye appeal This S-Mint Liberty Seated Quarter issue comes from a lower, original mintage of just 392,000 coins struck in which only five are graded finer by PCGS. 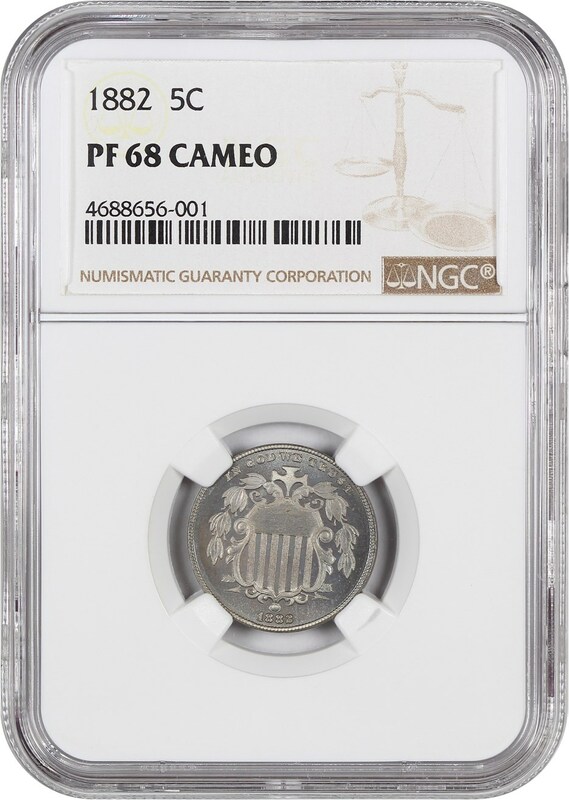 Value: The PCGS Price Guide has this coin valued at $6,000, and it is available for purchase at just $5,750 via Make Offer! 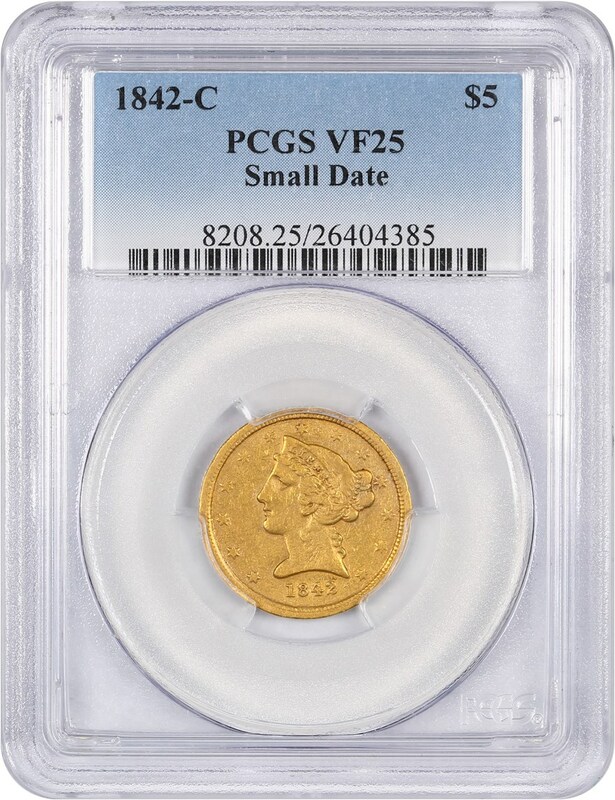 With the last two auction records of just over $6,100 and $5,500, this gem S-Mint Seated Quarter type coin is a fantastic value priced directly within the current market range. Why we love it: A scarce, incredibly low mintage Liberty Half Eagle from the famously popular Charlotte Mint. The Small Date variety is much rarer than its Large Date counterpart for the issue. This C-Mint Half Eagle issue comes from a low, original mintage of just 4,595 coins struck in which surprisingly there are only 41 others graded finer by PCGS. Value: The PCGS Price Guide has this coin valued at $10,500; however, we are offering this scarce, low mintage Half Eagle from the popular Charlotte Mint at just $9,750 via Make Offer! Why we love it: A better date, early Half Cent type coin from a popular year among collectors that displays nice, original surfaces with even coloring and wear. This early type coin is worn lightly and evenly across its surfaces with a smooth, pretty, darker brown coloring. The originality and attractiveness of this desirable Half Cent along with the lack of porosity problems gives it high-end eye appeal for the grade. Value: The PCGS Price Guide has this coin valued at $450 with the CPG at $407. It is available for purchase at the fair and reasonable price of just $375 via Make Offer! 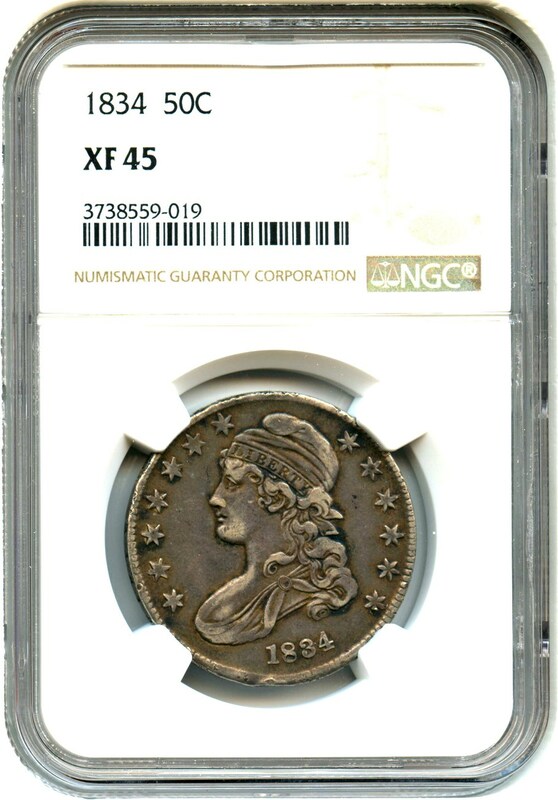 That is a solid $75 discount off the PCGS Price Guide value for this popular yet affordable early Half Cent type coin! Why we love it: A flashy gem proof Lincoln with pristine, blazing red surfaces and nice eye appeal. 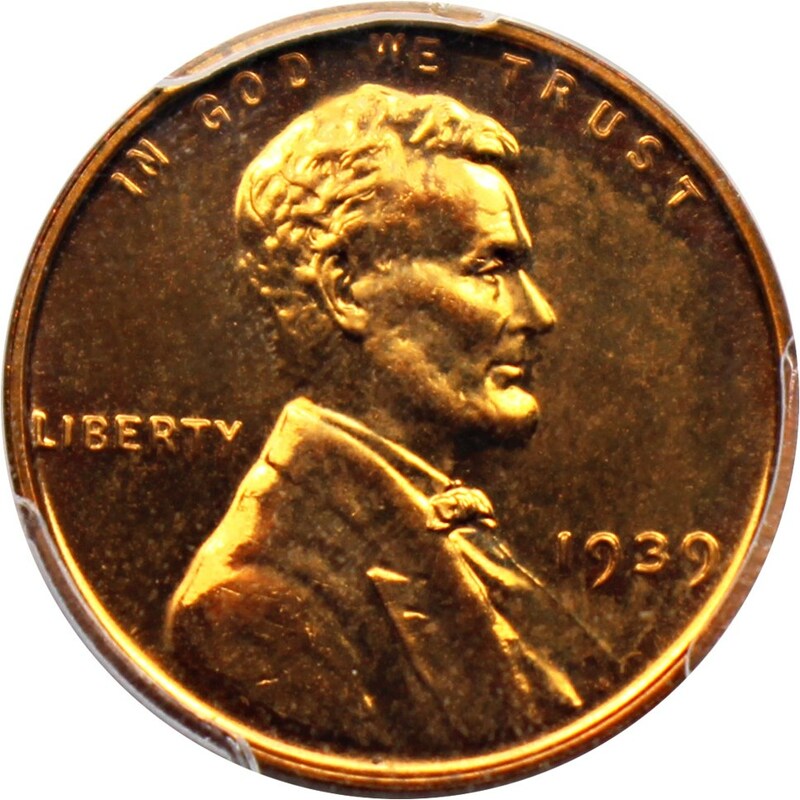 This Lincoln Cent issue comes from a low, original mintage of just 13,520 coins struck in proof format in which only 45 are graded finer by PCGS. Value: The PCGS Price Guide has this coin valued at $275, although this blazing red gem proof is available for just $250 via Make Offer in this week’s CWL. Why we love it: An affordable yet original example of this desirable final year of issue type coin for the Shield Nickel series. This coin is lightly, evenly worn, yet quite well-struck with sharply detailed devices. Its attractive coloring and subtle signs of remaining luster make it an accurate representation of the grade. Value: This attractive final year of issue type coin for the Shield Nickel Series is value at $130 by PCGS Price Guide. However, it is available for just $100 via Make Offer as part of our CWL special this week. We suspect this affordable, good-looking coin will find a home very soon! Why we love it: One of our favorite design types, though short-lived, is a reasonably priced yet attractive gem example of this popular and desirable Type 1 Denver Mint Issue Buffalo Nickel type coin. This coin displays well-struck, pristine surfaces that are covered with pretty, light toning and incredible amounts of stunning luster. Value: The PCGS Price Guide has this coin valued at $275. It is available for purchase at the fair and reasonable price of just $250 through our Make Offer function. 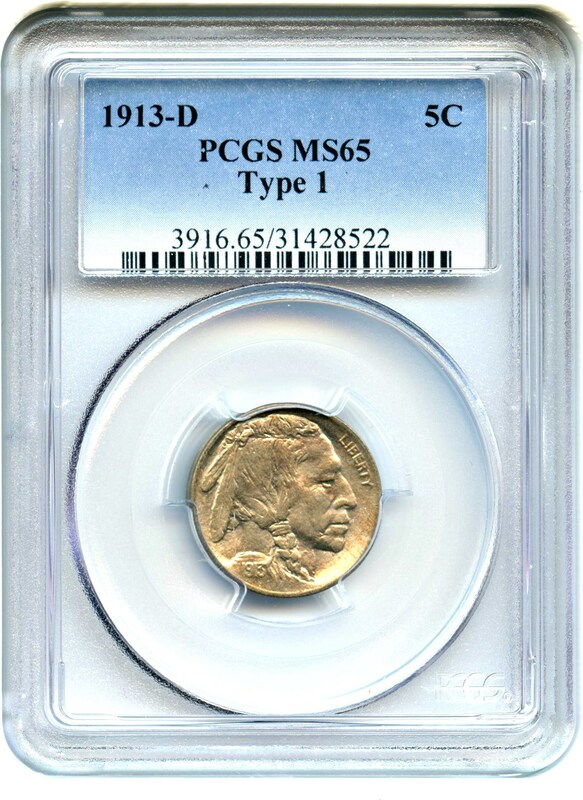 That is a $25 discount off the PCGS Price Guide value for this lightly toned, gem example of this desirable Type 1 Denver Mint Issue type coin! Why we love it: An affordable and original Capped Bust Half Dollar type coin of the Large Date, Large Letter variety. This ideal type coin features lightly worn surfaces, intriguing coloring and sharp, clearly detailed devices that make it true to its assigned grade. Value: The PCGS Price Guide has this coin valued at $275. It is available for purchase at the fair and reasonable price of just $225 via Make an Offer! That is a $50 discount off the PCGS Price Guide value for this affordable and completely original Capped Bust Half Dollar type coin! Auction #1008 Lots Posted. Browse & Bid Now!